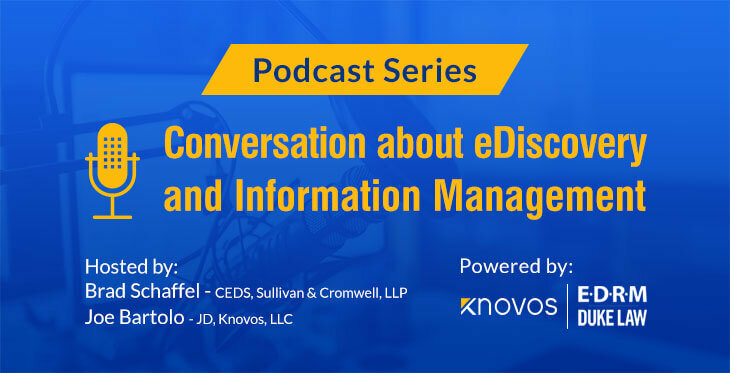 EDRM at Duke Law, in partnership with the new Bolch Judicial Institute, has joined forces with Knovos to produce a series of podcasts on eDiscovery and information management best practices. Podcast hosts Brad Schaffel, CEDS, manager of eDiscovery and litigation support at Sullivan & Cromwell LLP, and Joe Bartolo, JD, Knovos’ director of information governance and risk solutions, will interview a variety of subject matter experts and litigation support professionals about the use of technology to help fulfill information management and compliance obligations. The first episode provides a general discussion of the eDiscovery landscape and a peek at future podcast topics. For the second episode, Brad and Joe speak with Scott Cohen, managing director of information governance and eDiscovery client services for Winston & Strawn. Scott shares his views on the issues facing the eDiscovery and litigation support industry, offering insights on education, training, and how to best meet information management challenges. The third episode features an insightful interview with Cat Casey, global director of eDiscovery and practice technology at Gibson, Dunn & Crutcher. Cat shares her thoughts on challenges posed by new sources of data created by the internet of things, as well as data privacy issues. We intend for these recorded discussions to serve as a resource of useful reference information for those interested in managing electronically stored information throughout the various stages of the EDRM life cycle. Your comments and feedback are encouraged! Learn more about Knovos’ new co-sponsored podcast series on the EDRM website at https://www.edrm.net/resources/podcasts.